Since Steve Jobs held aloft the first iPad in 2010, we've been hearing that tablets are posed to take over from laptops and desktops as our computing devices of choice - so as 2017 unfolds, are these super-powered slates finally ready to step up to the mark? With a wealth of 2-in-1 devices now on the market, and the likes of Windows 10, iOS and Android getting more powerful all the time, it's never been easier to trade in your old computer and move to a stripped-down, streamlined tablet device. Here's what to consider. Whether or not you can replace your laptop with a tablet doesn't depend on the latest specs or software, or how much you've got to spend - it all depends on what you already do on your existing computer and what you want to do on your new tablet. Laptops are still, by and large, much more powerful, and so if you're looking to do some serious gaming or some serious video editing, even the best slates on the market are going to struggle to keep up. On the other hand, if all you're concerned about is some light web browsing, some social media, and some Netflix watching, a tablet will suit you fine. There are other trade-offs to consider: tablets are generally lighter and more portable than laptops, which will make a difference if you're on the move a lot of the time, while laptops can go higher in terms of screen size. At the moment the biggest tablet displays top out at 12-13 inches, while laptop ranges often go up to 15 inches. So before you start shopping around for specific devices, think about the ways you're going to use your tablet - if you can work with smaller screens and less powerful components, and you're still going to have access to all the apps you need, you could be eligible for a laptop-to-tablet conversion. Hardware specs are undoubtedly important, but your first and most significant decision is what operating system you want on your tablet - it's going to affect what you can do with it, the apps you can run, and the accessories it's compatible with. Leading the way is Microsoft: not only has it built Windows 10 to be an OS that's equally happy on a traditional computer or a tablet, it's produced some of the best 2-in-1s on the market in the form of the Surface Pros. The benefit of going Windows is that you have a full desktop OS at your fingertips, capable of running Photoshop, iTunes and all the rest. Next in line is Apple, which continues to add features to iOS (like Split View) to make the iPad a more viable productivity machine; in fact, it's even added the Pro name to ram the point home. iOS is not as powerful as macOS or Windows, though, and you're going to be limited to mobile versions of apps like web browsers, image editors and office suites. Google is lagging behind in the 2-in-1 and tablet space. Android continues to feel awkward on a tablet, though the Pixel C is a decent device, while 2-in-1 Chromebooks are only just beginning to become a real proposition. Unless you're a real Google die-hard, we'd suggest looking elsewhere for a tablet OS right now. To turn your tablet into a full laptop replacement, you need a keyboard cover and probably a mouse too - again Windows and Microsoft have you covered, with a ton of official and unofficial accessories to choose from to turn your slate into a more traditional computer at a moment's notice. The newest iPad Pros come with keyboard connectors and a wide choice of keyboard accessories too, though in terms of other inputs you're stuck with the Apple Pencil - there's no way to hook up a mouse and no trackpad on the keyboard, because iOS is still very much a mobile-first OS. That may make you think twice about taking the Apple route but again it depends what you want to do with your tablet. Thanks to the wonders of Bluetooth it is possible to get keyboards and other peripherals connected up to Android tablets too, though you don't get the same range of choice. It's also worth thinking about anything else you want to connect up. The Windows 2-in-1 tablets are unique in having full-sized USB ports to plug accessories into, but note that iOS and Android can easily output documents to printers that work with AirPrint or Google Cloud Print if necessary. 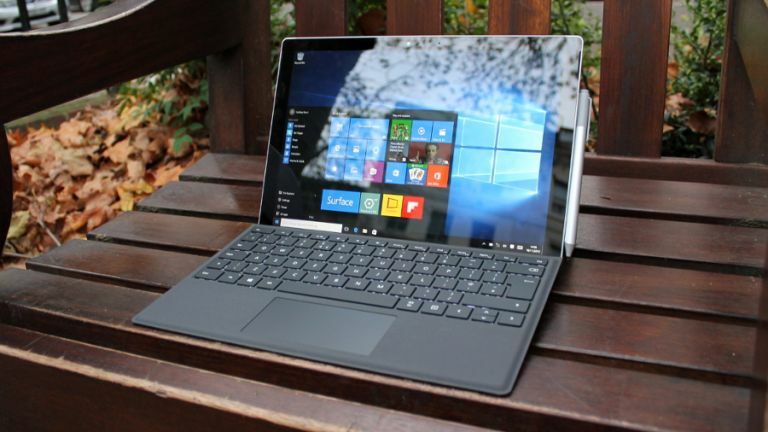 By now you should have a good idea whether or not you can replace your laptop with a tablet. One other consideration is what you're going to do with all your files and documents - obviously the more you have stored in the cloud, the easier this will be. It's when you're switching between devices like web-based services such as Gmail, Netflix and Spotify really show their worth. You can also make your life easier by switching from a Windows laptop to a Windows tablet, or from a macOS laptop to an iPad, though you don't necessarily have to do this (it's just a lot more convenient). If you've got the cash there's nothing to stop you buying a tablet and using it alongside your laptop for a while. It means there's no rush to get your files and apps swapped over, and you can identify any issues or problems before ditching your laptop for good. As we said at the start, switching to a tablet is now more straightforward than it's ever been, thanks in part to the way the line between tablets and laptops has been blurred. If you think it's going to work for you, delay no longer.